For spring break this year I went traveling on the Garden Route, a path up the east coast of South Africa, so named for the diverse vegetation, lagoons and lakes scattered along the way. A five a.m. departure time, we piled into the vans with our pillows and blankets, snacks and ipods and watched the sunrise slowly casting light on the highway as we sped up the coast. South Africa is a beautiful country. Hilly, washed-out yellow farmland with grazing sheep borders the side of the road and far in the distance gives way to looming green mountains, with waterfalls snaking down their sides, white streaks painted on a canvas of pure jade. This was so different from the rocky crags that surrounded us in Cederberg. The changing, diverse landscapes of South Africa never cease to surprise me. We stopped at a backpackers hostel in a town called Wilderness, with the Indian Ocean crashing down on stretches of beach in front of us, and the gorgeous, Jurassic feeling mountains right behind us. The weather wasn’t the usual African sunshine we were used to, and the drizzling rain threw a misty fog over everything. 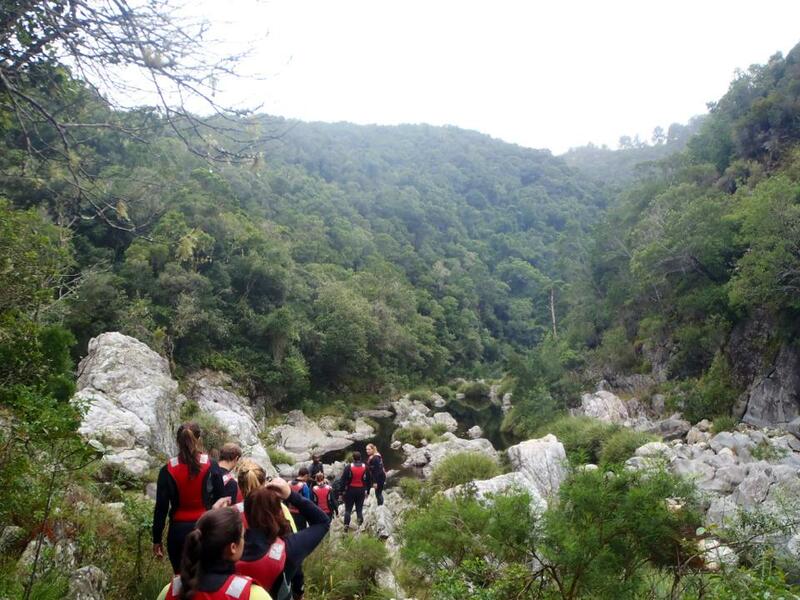 One of my favorite things we did was kloofing. This involves strapping on wetsuits and hiking through the forest down the mountain into the gorge. Jumping of cliffs (kloof=cliff) into the water down below and swimming through the river. The other kloofers and I floated down the river, laughing and chatting, cheering each other on at the big jumps. The place was absolutely, unequivocally, SERIOUSLY beautiful. I found myself looking up, marveling at the thick vegetation clinging to the mountains around us, feeling like I was in a whole other world, and realizing that I was. This country is burying itself into my heart. i love how descriptive your writing is. And, of course, thrilled that you are taking full advantage of being in S Africa, and sharing with us.